Have you found any real steals at thrift shops lately? Four of the five of us went to Value Village on Monday, the 50% off day in the U.S. We were there for almost 2 hours. It was somewhat crowded. Kinda says something about how people are feeling about the economy. We arrived around 10:30 AM. When we first got there, the racks looked fairly full. But 2 hours later, the racks were looking sparse. It pays to get to these 50% off days early. We tried to get out earlier, but it's hard with a group, isn't it? On the whole, our family is pretty choosy when it comes to clothing. And not just about style, about quality. If something just isn't well-made, it's not worth it. If something is too worn, we pass it up. If something's not a good fit, it's not coming home with us. And if it's not just the right color (and I can't think of a way to change it to the right color), then it's not meant to be. And even with our pickiness, we still all found some things we wanted. One of my daughters was looking for a new pair of jeans. She tried on almost every pair of jeans in her size. (She knows that I can alter the leg of the jeans if they're too wide, but fortunately this time I won't have to do that.) I don't know if you know this quick trying-on trick -- knowing she wanted jeans, my daughter wore a pair of leggings under her skirt. She was able to just slip the jeans on while standing there next to the rack. We saw another young woman who had also worn leggings, so that she could try things on this way, too. Dressing this way saves having to wait in the long, long lines at the dressing rooms (6 dressing rooms for the whole store). Sounds weird, eh? My other daughter was looking for a blouse that she could wear over a t-shirt. So she dressed in a way that allowed her to try on blouses without having to wait for a dressing room. My husband, just goes by the sizes. Men's clothing is a bit more reliable that way. But when I've been shopping for him, I've brought a fabric measuring tape in my purse, to be my guide. This time, he was on his own, as I was shopping for myself. I was looking for a lilac-colored t-shirt, to wear under a cotton blouse this summer. (I had a specific shade of lilac in mind. I actually got lucky and found 2 t-shirts that I liked a lot. One was a better shade, and I went with it.) So, I dressed in a close fitting t-shirt, over which I could try on other shirts. As an after thought, I think I'd have done better wearing a leotard as a shirt. Don't like even a peek at my midriff in a public place. We did fairly well, not phenomenally so, but much better than at the mall. We bought: 1 pair slacks for my husband, 1 belt for my husband, 1 t-shirt and a lightweight sweater for me, a pair of jeans, a sundress and a short prom dress for daughter no.1, and 2 blouses for daughter no.2. I love my new t-shirt. I easily could've seen myself spending $25 to get just the right shade of lilac. And a new pair of jeans for daughter no.1 would've cost another $25 at a place like Target. Those two items alone easily could've cost $50. 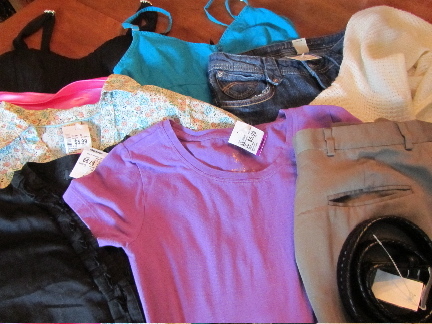 But we spent $35, and bought those items, plus 2 blouses, 2 dresses, 1 pair slacks, a belt and a sweater. Not bad, but it seems to me that thrift shop prices have gone up in recent years. Have you found this to be true, too? and don't be afraid to just say no, if it isn't really what you're looking for. There will more opportunities in the future. Thrift shopping is an adventure, a treasure hunt, of sorts. If you missed the 50% off day at Value Village this week, there'll be another one on the 4th of July. The 4th of July sale is particularly good sale for buying children's school clothing, as they've recently received a lot of school-appropriate donations, with school having just let out, paired with the fact that not many families have been shopping for school clothes (the racks pile up with this stuff). So, check for winter jackets, jeans, t-shirts, etc at that time.